This came up for sale locally (with some rather high contrast images masking the repainting... aha). 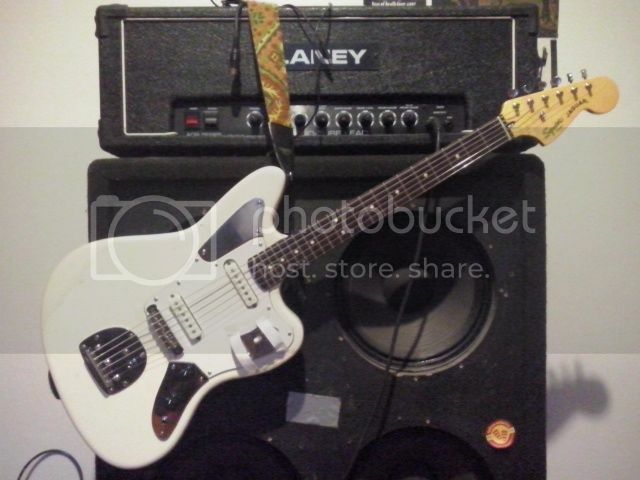 I've never had a guitar with the classic jag/jazz tremolo, so I'm going to throw together a cheap jaguar. 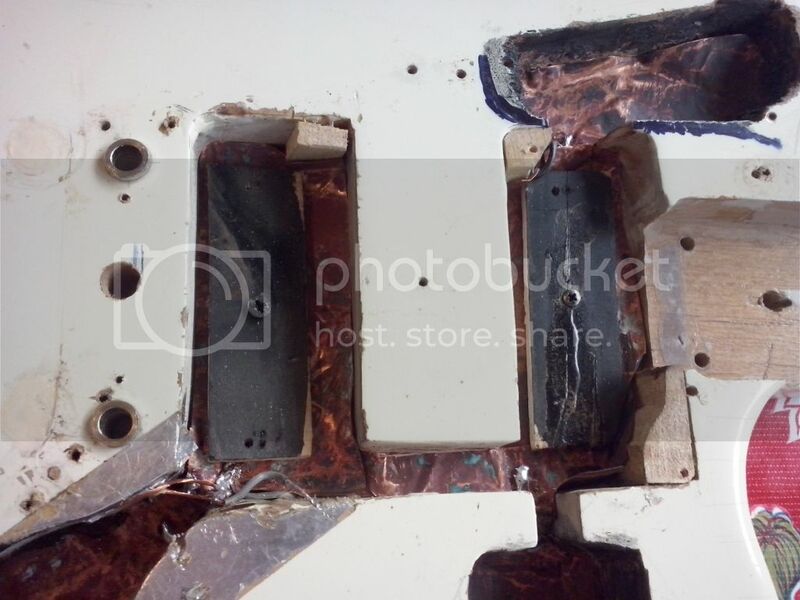 The body (apparently homemade, decent wood though) is a mess, looks like it was originally intended for humbuckers and the bridge has been moved forward (longer scale)? The contours have been reshaped and the post holes filled then the bare parts painted over in creme paint. 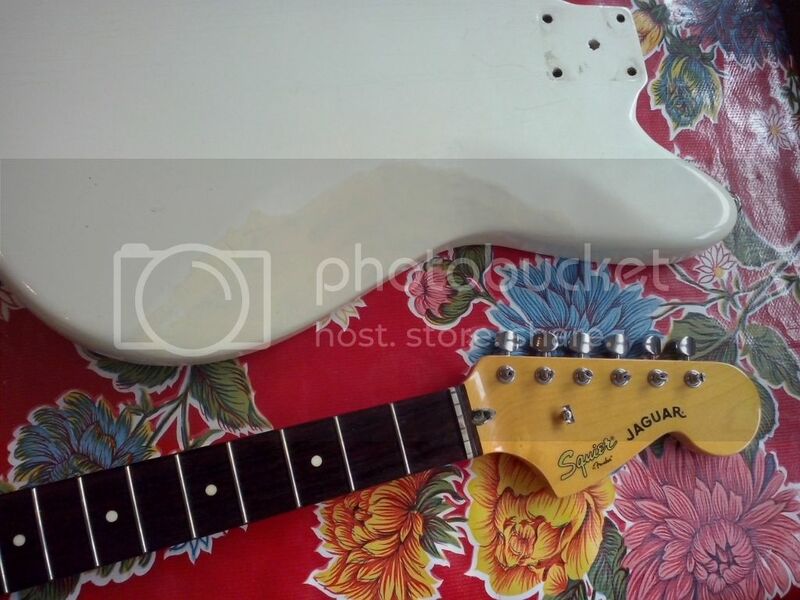 Neck is from a Squier Vintage Modified Jaguar. Came with an allparts trem, Mustang bridge, red tort guard. I'm going with Jag pickups, probably four-way tele wiring (Neck, Bridge, Series, Parallel), one vol, one tone, 1 meg pots. Will omit the rhythm circuit/strangle switch. Parchment guard. 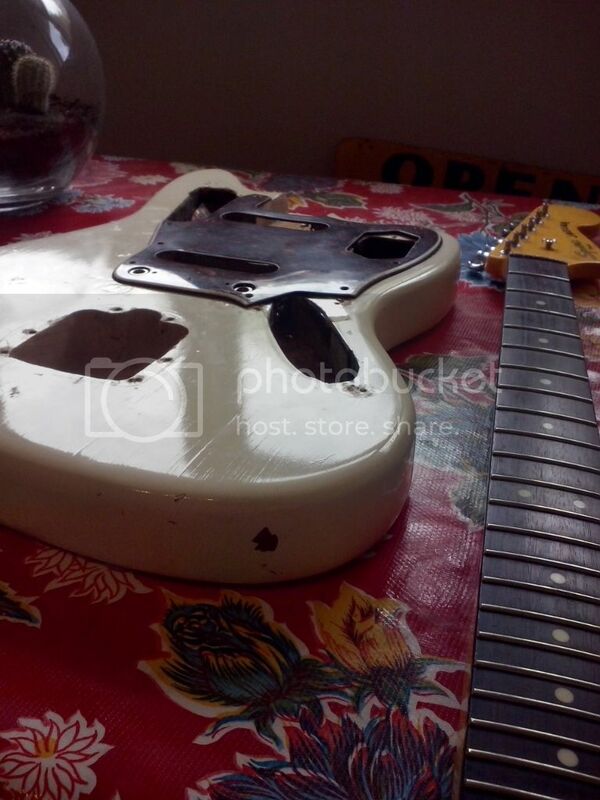 Will see how I like it before considering a refinish/more complicated wiring. Man, those routes look pretty rough, manageable I guess. 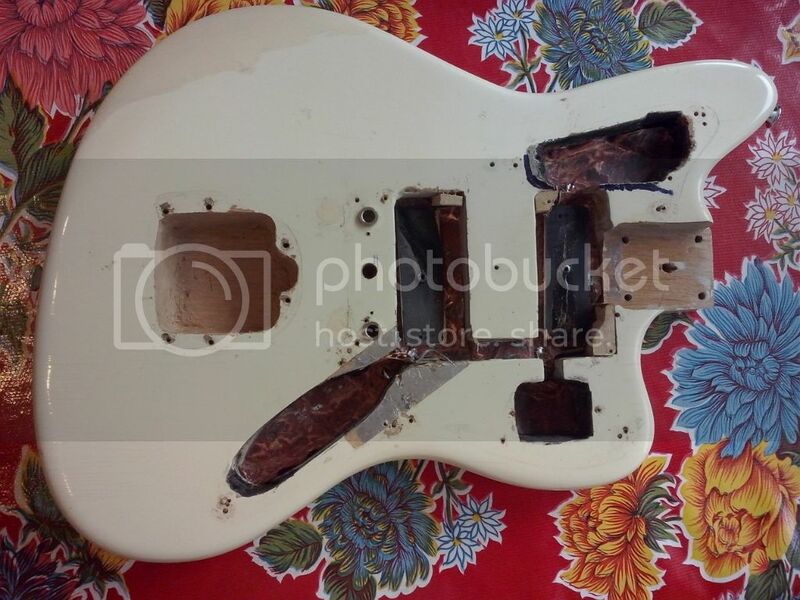 This seems like a good place to try out a refinish, can always strip and try it again right? Might be worth trying to redo the routes too but up that seems like a pain. Hell maybe even replace the route with a pool? what a mess! just bring her back to life!! Need to swap the pickups (stuck the bridge in the neck aha)... and chisel the switch deeper to fit the tele switch (hence the tape). Lots of setup crap to do properly but I was impatient just to string it up and see if it was a total wreck. The pickup mistake will work out better, since I can just flip the pickups and switch around without any rewiring, so it'll be Neck-Parallel-Bridge-Series, which makes more sense to me than what it would have been (Series-Neck-Parallel-Bridge).